The Auto Turret is a fully automatic entry denial device that is used for defense. (Mainly placed in bases) The turret requires regular type 5.56 ammo to operate and will track and shoot an unauthorized player within it's 180 degree view. This view will go up to 360 degrees if it is tracking a target. Player can be authorized on the turret whilst it is turned off. The turret also has a peacekeeper mode where it will only attack armed players.The turret can be picked up by holding hammer. Many people know this but the Auto Turret can be baited. Once the Auto Turret locks onto an unauthorized player it will shoot at the player until they're dead, this of course can be exploited if someone baits the Auto Turret to shoot at them where the Auto Turret can not hit them. Auto Turrets can shoot players from 20 - 30 meters away from all angles, this is roughly 10 foundations or 10 storeys high. 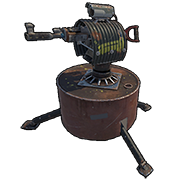 While the Auto Turret can be baited to shoot, most raiders will destroy it by using explosives. Fortunately Auto Turrets can be protected through many ways, such as being enclosed behind a Prison Cell Wall or peak over a Low Wall (e.g. Stone Low Wall). The Auto Turret has a 360° shooting angle when targeting someone, although has a 90° viewing angle when idled. That being said, the Auto Turret can not see a player if the player is behind it, only once the player has damaged the Auto Turret in any way will it react and target the player. Auto Turrets can be a viable option for offense and defense. They can be used as protection when raiding, being set up around the breach making sure no 'outsiders' sneak up on the raiders. 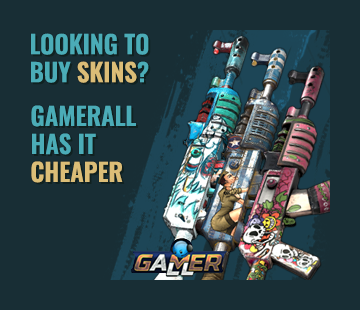 Conversely, they can be used as defense for a base, guarding loot rooms while the base owner is offline or away from their computer. The Auto Turret can hold a maximum of 1,536 5.56 Rifle Ammo, unfortunately it can not use Explosive 5.56 Rifle Ammo, HV 5.56 Rifle Ammo, or Incendiary 5.56 Rifle Ammo. It may have low damage but the fire rate is extremely high. and can kill a fully geared player in seconds. Perfect to have in a compound to protect your large furnaces from people laddering in!